Maria Luisa “Wichie” Garcia, 75, entered eternal rest on Friday, November 30, 2018 at Doctors Hospital at Renaissance in Edinburg. She was born on Friday, October 15, 1943 in Rio Grande City, Texas to Ernesto C. Arredondo and Angelica Chavez Arredondo. She is preceded in death by her parents and brother in law; Francisco Barrera, Sr.
She is survived by her children; Ernesto Garcia, Oscar Roel (Cristela) Garcia, Jr., and Fameliza Edith (Omar) De La Rosa, her only sister; Fabiola Arredondo Barrera, her niece and nephew Francine Barrera Diaz and Francisco Barrera Jr, 6 grandchildren, 1 great granddaughter. 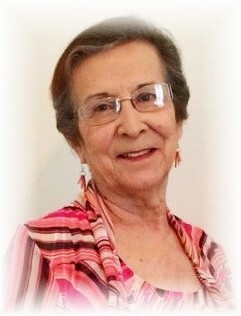 Wichie graduated from Rio Grande City High School in 1962. She will be remembered as the best dancer. She also graduated from Beauty College and Bookkeeping. She worked for Camargo Brick and Border Enterprises for many years until her retirement. She had a strong Christian faith and was the pillar of her home, always instilling Christian values and good morals to her children, grandchildren and those around her. She was a walking testimony and was not afraid of sharing the word of God. She was a prayer warrior always interceding for others and was always there to encourage and comfort. Her greatest joy was being an intercessor and being with her family. She was truly a blessing to all who knew her, but her legacy will continue through her children, grandchildren and all whose lives she touched. Her family will receive family and friends today, Sunday, December 2, 2018 from 10:00 AM – 9:00 PM with a prayer service at 6:00PM in the Chapel of Peace at Ceballos-Diaz Funeral Home, 322 East Kuhn Street in Edinburg. Christian services will be held on Monday, December 3, 2018 at 1:00 PM in the Chapel of Peace at Ceballos-Diaz Funeral Home with her son; Pastor Oscar Roel Garcia, Jr. officiating. Christian burial will follow to Hillcrest Memorial Park Cemetery in Edinburg. Having the distinguished honor to serve as pallbearers will be: Christian Angel Garcia, Michael Ivan Garcia, Francisco Barrera, Jr., Gasper Gonzalez, Eliseo Gonzalez, Victor Hugo De La Cruz and Lee Alvarado Funeral services have been entrusted to Ceballos-Diaz Funeral Home in Edinburg.